DNP ID400W - PFS / Photo Finishers Supplies Inc. The DNP ID400W is a wireless ID and passport photo solution that is compatible with a variety of digital cameras including the Sony DSC-WX50, Canon G1X,SX40 HS or S95. 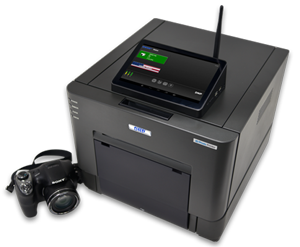 The system is comprised of the ID400 printer and Toshiba FlashAir SD cards. Only cameras with an SD card slot and DPOF menu function will be supported. Please note that some cameras may not work well with the wireless LAN cards. This passport configuration provides the same simple, direct and wireless solution as the DNP ID400DC you have the option of selecting a different camera. By inserting the supplied wireless LAN SD card into the digital camera, you can print photos without having to switch storage media or connect cables. Use the digital camera's DPOF menu function to wirelessly transmit the image to print. The DNP ID400W Passport System is reliable and convenient and will provide a steady stream of revenue generation. Your customers will be pleased with the quality, speed, and compliant ID photos. The ID400 features include face recognition technology that auto-detects the position and size of a face in the image data auto-adjusting the image to match the ID photo layout selected. Choose from 22 built-in ID photo layouts including US and Canadian passports! You can also create your own original layouts with the supplied Utility Software. Additional features include print and store (USB flash drive required), logo printing, and printing images from an SD or USB flash drive. As a result, the DNP ID400W is ideal for traditional retail stores, portrait studios, office products, and pack & ship locations where ID and passport photos are printed. The DNP ID400W system includes a WIFI SD card to work wirelessly with many cameras on the market. With its automatic layout function installed in the DNP DS-ID400W, there is no need to perform layout processing, the DNP ID400W auto-adjusts the image size to match the ID photo layout selected. Face recognition technology built-in to the DNP DS-ID400W auto-detects the position and size of a face in image data to ensure correct placement.